I was lucky enough to be sent some beautiful yarn by Adriafil. This beautiful yarn is 100% Alpaca and comes in a multitude of colours. 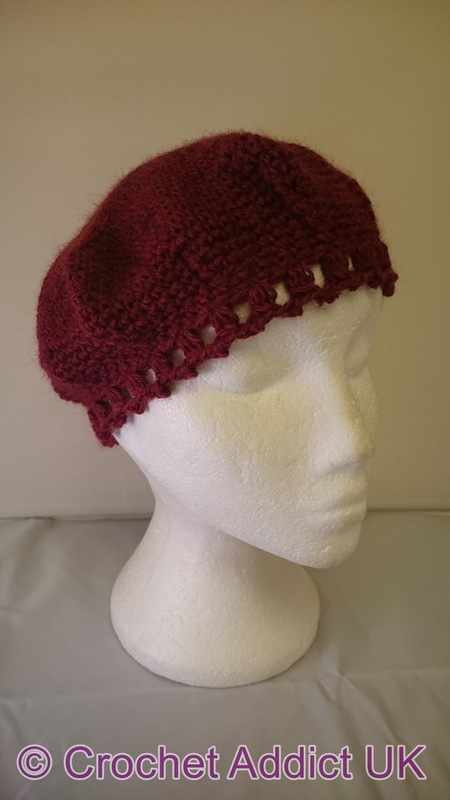 The yarn is made from extra fine Alpaca which makes it beautifully soft. The fleece comes direct from South America and is of the finest quality. I was sent 2 balls of Mélange Burgundy (21) to work with. you just want to squish it :-). and works up with a beautiful drape to it. It's also easy to frog as long as you take it slowly. 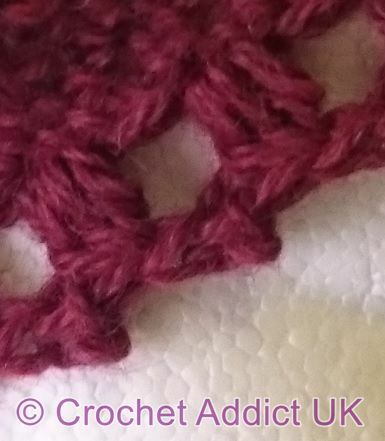 so good as you are crocheting. You can tell the quality in it just by the feel. with a relaxed drape to it. that extra special something to any project. With such a beautiful yarn I wanted to design something special for you. I was watching the film "Christmas Kiss". Puff Stitch - Yarn over (yo), insert the hook in the stitch, yarn over, draw the yarn through the stitch, yarn over, and draw the yarn through the 2 loops on the hook. In the same stitch, repeat the preceding step twice. Yarn over and draw the yarn through all 4 loops on the hook. To make the hat wider don’t make as many decrease rounds. To make the depth deeper copy round 30) for amount required. Patterns are just for your own personal use. Do not distribute the pattern without permission. You may sell the items you make but please give credit to me for the pattern. 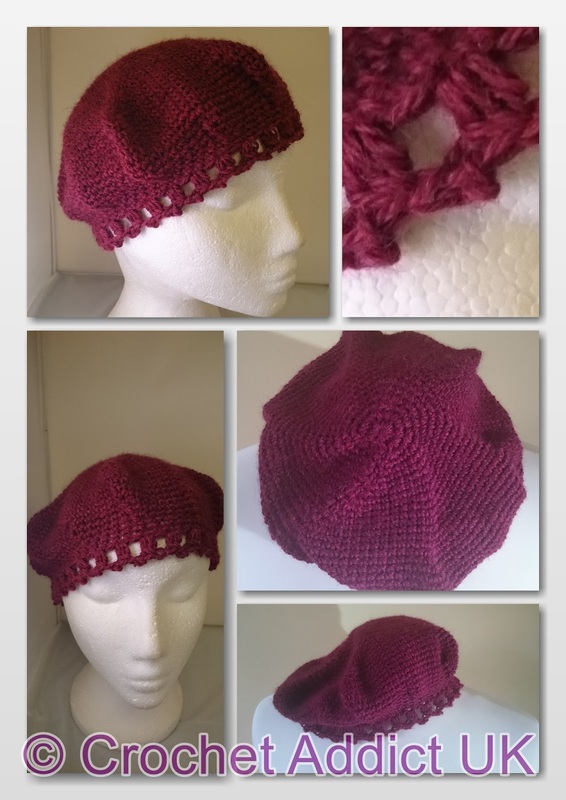 Please feel free to share the pattern link but not the pattern itself. This pattern hasn't been tested. If you find any errors please let me know and I'll amend the pattern. I was sent the yarn to review. This would be cute with a ribbon run through it also. I like the edging you chose, and Melissa's idea about the ribbon. This is a beautiful pattern. I was wondering what yarn would you recommend if I was not going to use the stunning alpaca that you made yours with?? I'm looking forward to making this but am not able to spend a lot of my yarns. I priced alpaca locally and it runs anywhere from $8.00 to $15.00 a skein. Some day I will be able to spend that much (and love doing it ) but I can't right now. Thank you for your time. I'm really sorry but I haven't made this hat with any other type of yarn so wouldn't be able to advise you. Looking at the yarn details they are; 4ply/DK 3 - 3 1/2 mm US4 Gauge 4''=22 sts/30 rows so you could look for a similar weight yarn and try that. I am sorry to hear that. I hope it looks better once it's on your head.